I have a little (not so little) plastic folder with images in different sizes so that I can use them in the future and they sometimes prompt my creative brain (not the one usually in use) to go with the flow. This is exactly what happened here. 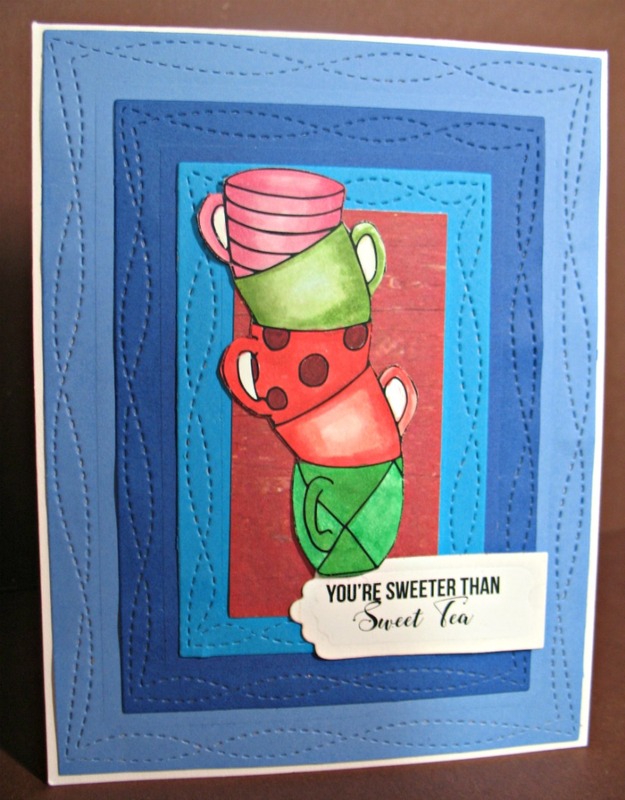 I cut out the cup and chose the color of cardstock, cut it and went on from there. I thought I'd sweeten the cup with sugar and saw red yet again. I searched my ribbon box and came up with that great red and green plaid and added the other ribbon to liven up the design. I wasn't sure about lining up the top tag, but went with it on a slight diagonal. It is pretty awesome in real life. I'm hoping this inspires you to get your fold on! 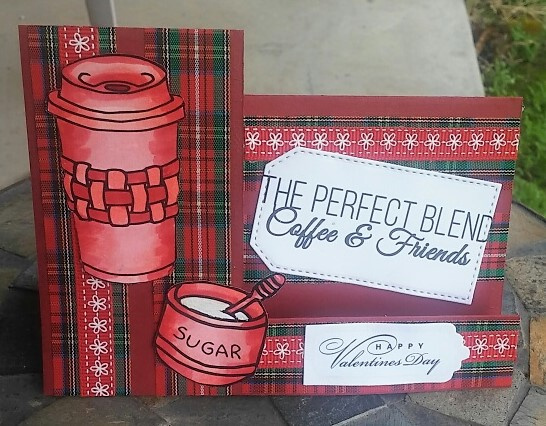 Please join in A2Z Scrapbooking's "Fun Folds" challenge for your chance at a free digital stamp set AND, if you used Hero Arts or Sugartree Stamps, a $20 gift card to the A2Z Scrapbooking etsy store. The a2z scrapbooking store carries a wide variety of Hero Arts products as well as a nice selection of digital stamps (both Hero Arts and Sugartree digital kits)! Get discounted new releases, sales, grab bags & more. Proceeds from our store benefit Celiac & Behcets disease foundations. Use my discount code Arlene15 to get 15% off your purchase of $25 or more. 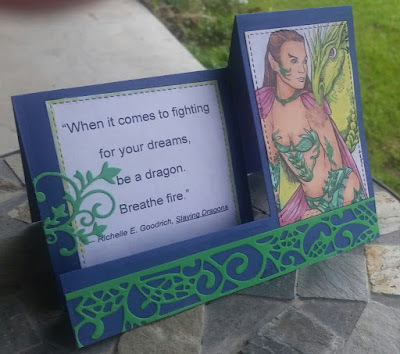 If you're looking for a Hero Arts product you don't see in store, use the Request Custom Order button from with-in the shop. Altenew is the sponsor for Die Cut Divas during the month of April and the prize is a $20 gift certificate. I am jealous, to say the least, so be sure to join the challenge at Die Cut Divas. Altenew is known for the many wonderful flower stamps and dies that have made stampers extremely happy with their products. I have my favorites and "Dancing in the Rain" stamp and die set is one of them. There are so many fun images and great sentiments in the set. 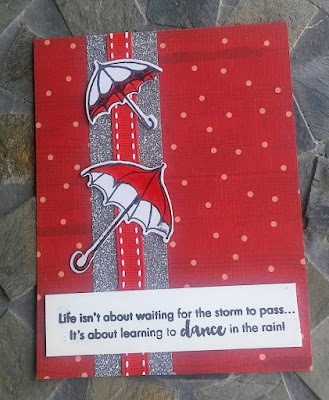 My first two cards features the "Dancing in the Rain" stamp set from Altenew. You can find the stamp and die set here. 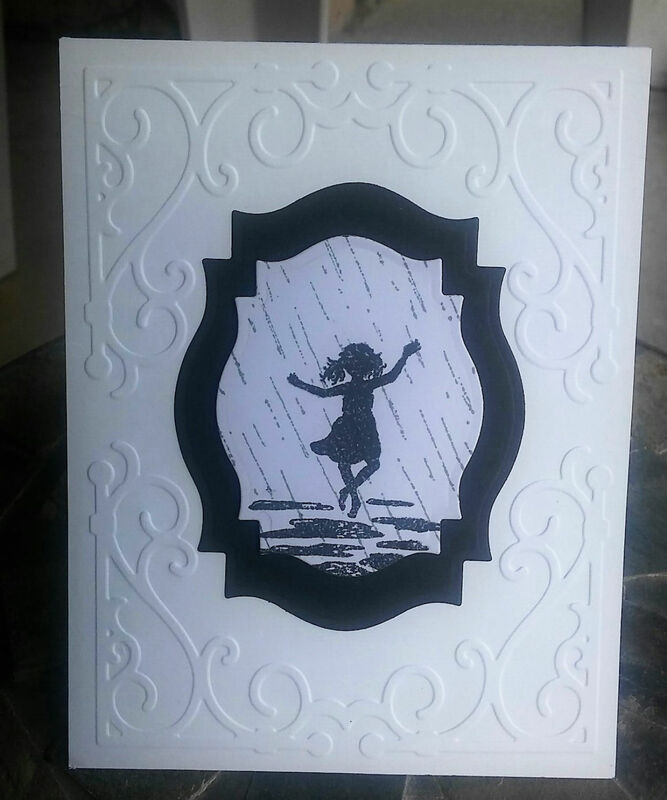 My first card features a silhouette of a little dancing girl in the rain and puddles. There is a rain stamp and the little girl dancing in the puddles stamp which combined to make the cutest stamped scene. Silhouettes make great cards, adding an embossing folder and dies. I used the sentiment "Life isn't about waiting for the storm to pass... It's about learning to dance in the rain." My second card features a couple with an umbrella standing in some puddles with the rain sleeting down. 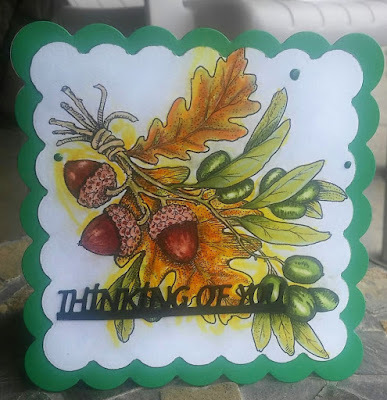 Three stamps were used to create this card (rain stamp, sentiment stamp and couple stamp). I thought a non-symmetrical look might fit this card. I used Hero Arts London Fog for the rain so the rain image doesn't overpower the girl or couple. 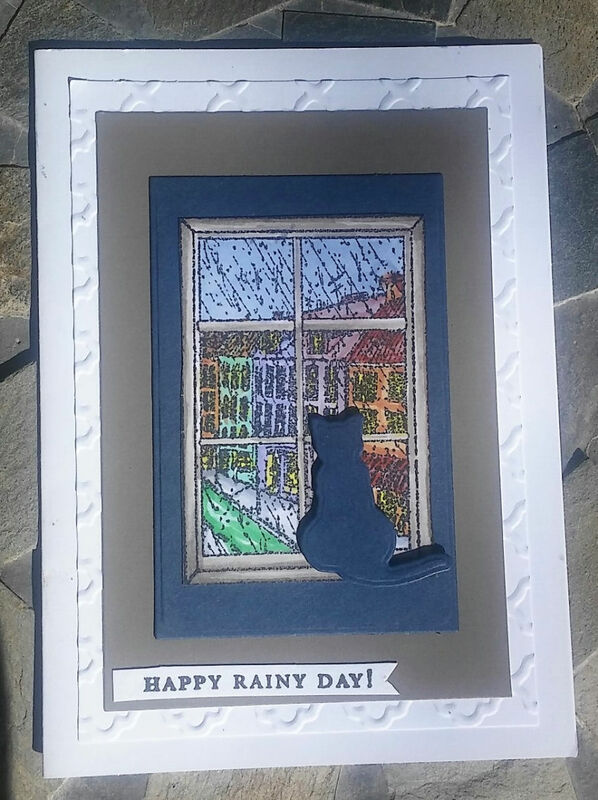 Though the stamps have matching dies, I decided to use the rain as part of the scene and used framing dies for my cards. 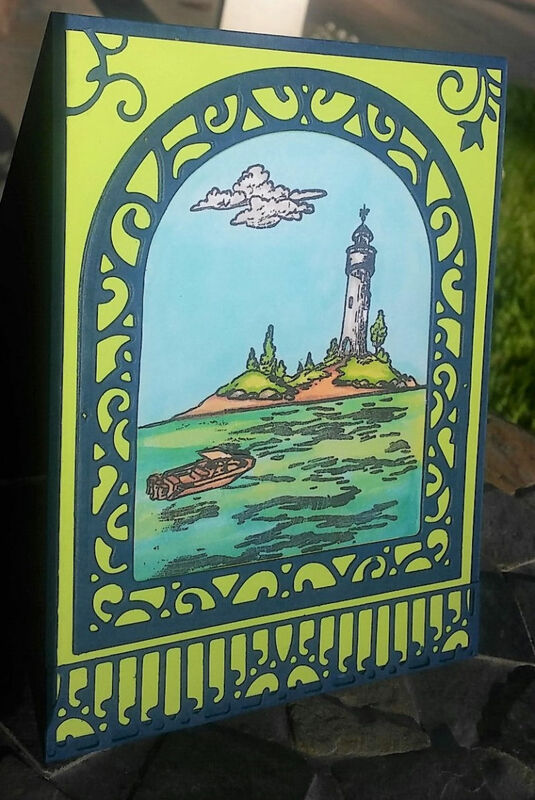 For my thrid card, I used another Altenew stamp set for a scene with a lighthouse. One of my favorite things to investigate is a lighthouse. I've seen marvelous lighthouses along the coast of Maine and California. I don't usually make fold cards, but I might start making more of them since I finally got the hang of how to line up the die with my paper and how to FOLD it. I'm glad A2Z made me try. I think it was the monotone blue on this deep black background that made this so special. I will be leaving this on my desk for awhile to remind me to try new things and be an inspiration. announcements! Please join in this month’s "Fun Folds" challenge at A2Z Scrapbooking for your chance at a free digital stamp set AND, if you used Hero Arts or Sugartree Stamps, a $20 gift card to the A2Z Scrapbooking etsy store. 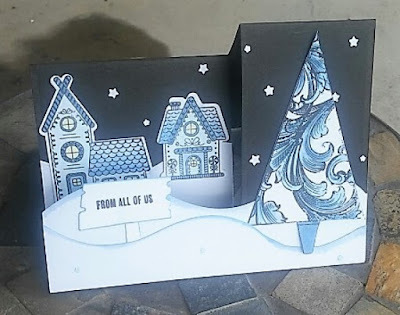 April's challenge at Die Cut Divas is all about WATER (rain, lakes, ocean, streams, rivers, dark clouds full of water, glass of water, tears, water color, just have some sort of water on the card. 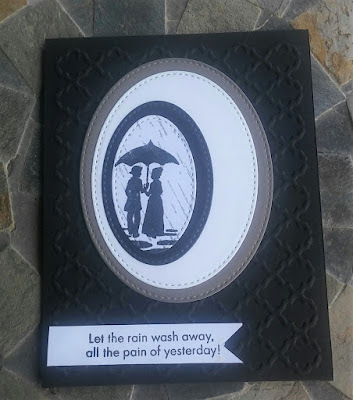 My card features stamped, die-cut umbrellas and a great sentiment from "Dancing in the Rain". I used Copic marker R27 to color the umbrellas, glue dotted to the strip of silver tape and red ribbon. 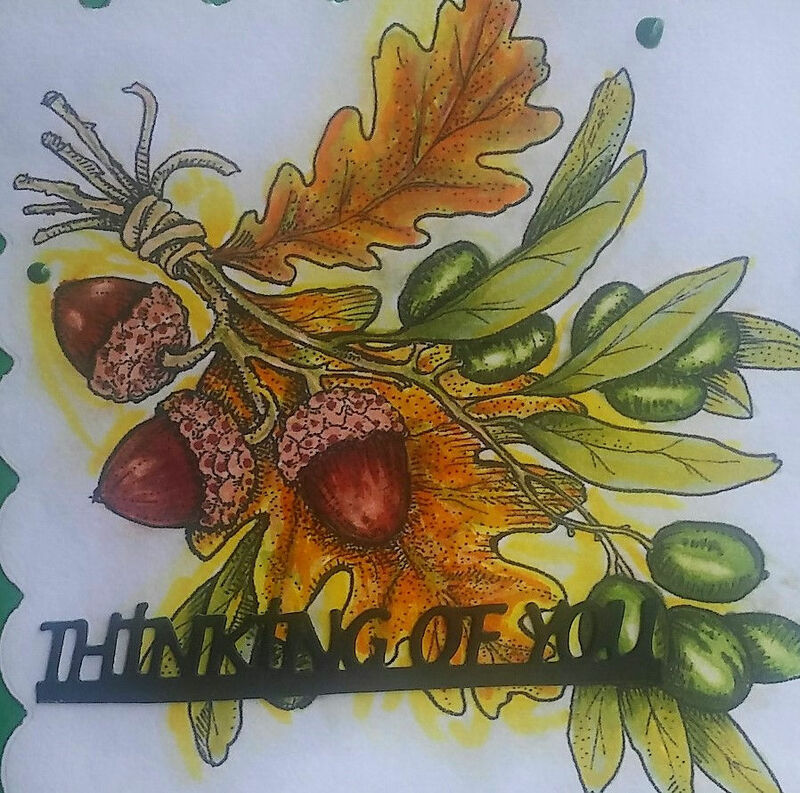 I sent this card to my partner in Spain for the March Card Chain Challenge. I loosely based my design on the March sketch option below with the technique option to use Stamping or Decoupage. 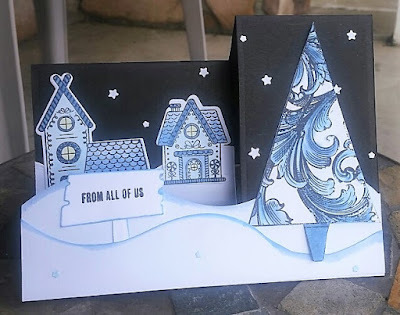 Crafting with Friends - "Anything Goes"
Colour Crazy - "Anything Goes"
Crafting By Designs - "Anything Goes"
Last day to enter Die Cut Divas' March challenge of "Anything Goes". 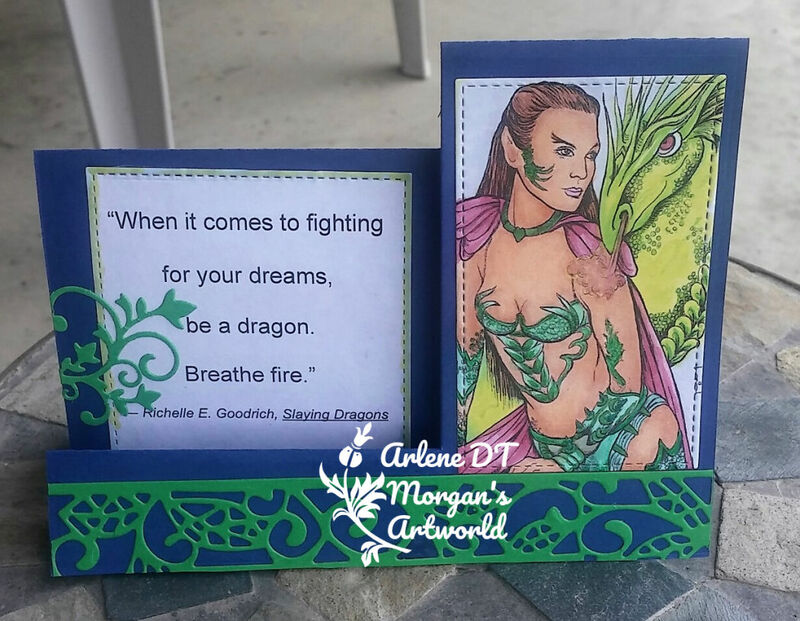 This post represents both Die Cut Divas and Morgan's Artworld challenges, the last day of Die Cut Divas' challenge and the first day of Morgan's Artworld April challenge. The more I worked with this image, the more enamored I became. 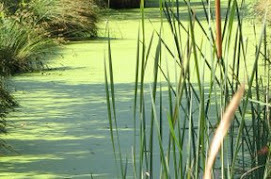 The colors seemed to flow after I figured out what my first color would be (green). The Morgan's Artworld Open Challenge is always "Anything Goes"
on Australian Eastern time (Sydney). 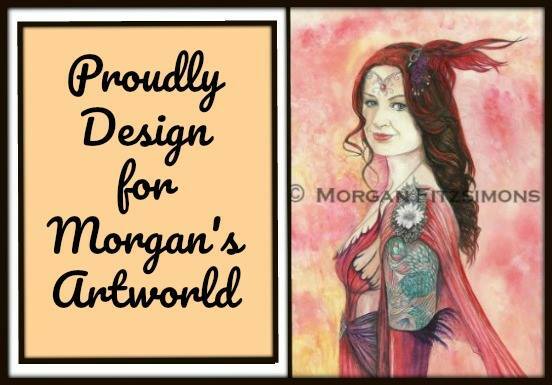 Be sure to check out and join the Morgan’s Artworld Facebook Group too. 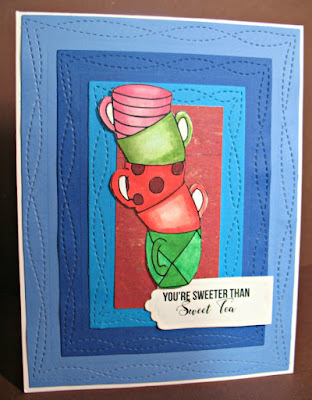 Creative Moments - "Anything Goes"
Crafty Friends - "Spring - use spring colors"
Simon Says Wednesday - "Anything Goes"
The House That Stamps Built - "Anything Goes"
Very simply, I created a background of dies and staggered the cups up the smallest die-cut, then die cut a sentiment. I'm a tea drinker and my breakfast tea is always in a cup or mug, so my sentiment has to be one for tea. Be sure to join the challenge at A2Z Scrapbooking. Are you on social media? 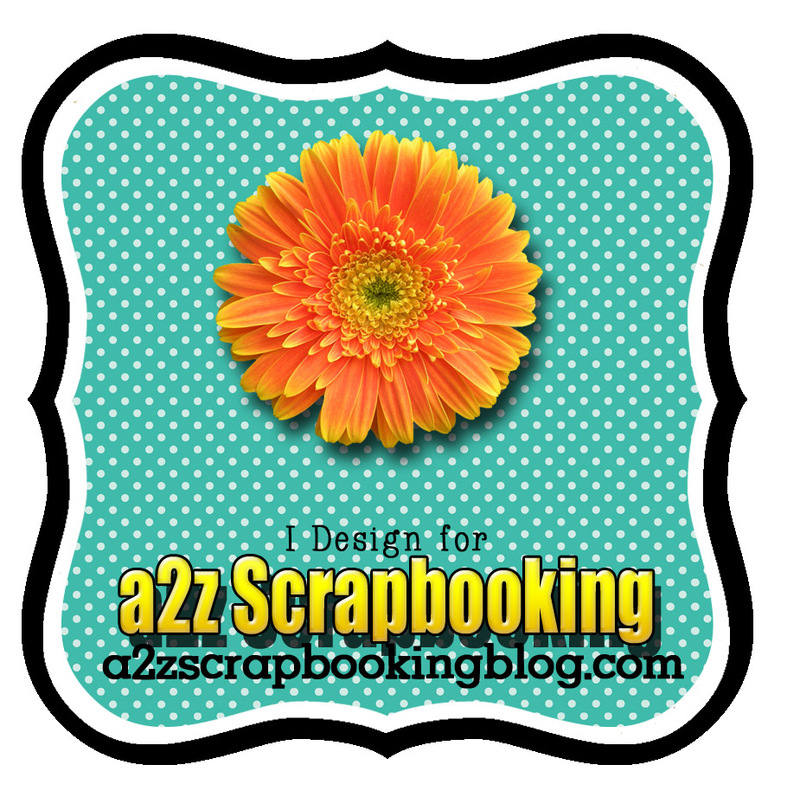 A2Z Scrapbooking is! Please join A2Z on Twitter, Instagram and Facebook? so you don't miss any fun promotions or new challenge announcements! 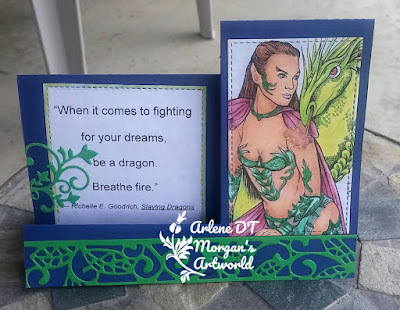 Please join us in this month’s "Color It In" challenge for your chance at a free digital stamp set AND, if you used Hero Arts or Sugartree Stamps, a $20 gift card to the A1Z's etsy store. 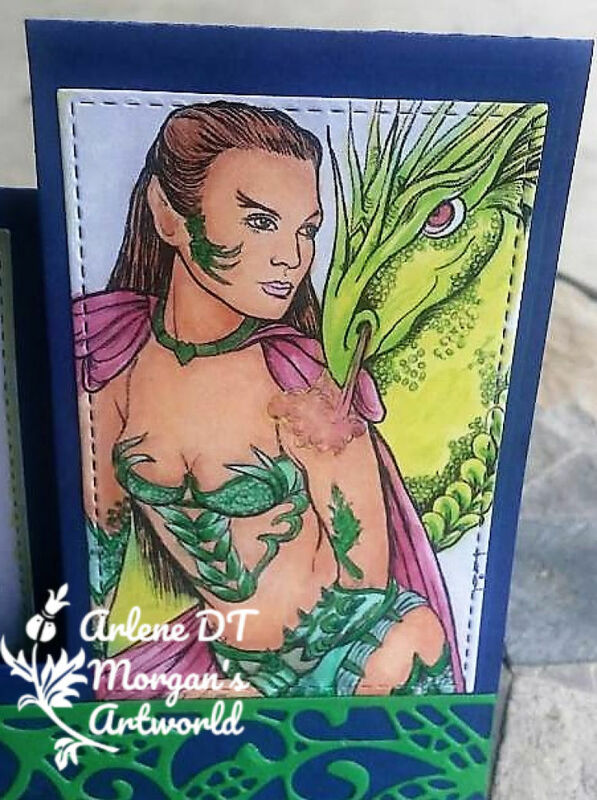 The a2z scrapbooking store carries a wide variety of Hero Arts products as well as a nice selection of digital stamps! Get discounted new releases, sales, grab bags & more. Proceeds from our store benefit Celiac & Behcets disease foundations. Use my discount code Arlene15 to get 15% off your purchase of $25 or more. If you're looking for a Hero Arts product you don't see in store, use the Request Custom Order button from with-in the shop. A2Z Scrapbooking Sugartree Stamps digital sets "Hug in a Mug" and "Farmhouse"
I know it's not Autumn, but my friend and I colored a great image and I wanted to share mine. This is a Power Poppy digital stamp and I thought it would be suitable for just about any event from a loss to a birthday with a "thinking of you" message. I think I'll be using this digi again and I'll try some other colors and see how they work too.